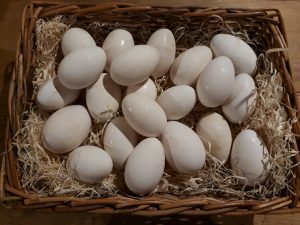 4 x Free Range Goose Eggs – collected daily from our free ranging flock of Embden x Legarth Geese. 4 x Free Range Goose Eggs – collected daily from our free range flock of Embden x Legarth Geese. Goose eggs have bigger and better yolks than a chicken egg and are richly flavored. As goose meat is to chicken, goose eggs are to chicken eggs. They are richer, heavier, and more deeply colored, this is because geese are almost exclusively raised on pasture. Goose eggs are especially prized by top chefs for making pasta, where the flavor from the extra-large yolks enhances all types of fresh pasta.